We all have stories to share from the tornado of April 27, 2011. Here are some from our members. If you'd like to share your PR story, please email Deidre Stalnaker. I am a national disaster public affairs volunteer for the American Red Cross, and my home chapter is the West Alabama Chapter here in Tuscaloosa. When I am not teaching, I deploy to disasters across the U.S. to assist with media interviews and public information efforts. However, when the Tuscaloosa tornadoes hit on April 27, I deployed right here at home to help with the overwhelming media attention. In just the first week after the tornadoes, my public affairs colleagues and I interviewed with more than 50 national, international, local, and regional media, some more than once. My colleagues were chapter employees or volunteers from California to Florida who came in to assist me, the same way I deploy to help other chapters in disaster. The West Alabama chapter does not employ a communicator (they only have four full-time employees), so it is up to volunteers to fill the need. As a public relations professor at UA, I recognize our community's disaster is a great opportunity for our students to gain hands-on training in public affairs while helping Tuscaloosa recover. I have organized a group of students from the Department of Advertising and Public Relations to create a Red Cross public affairs team. The team will have a full range of assignments including social media, photography, video production, writing, media relations, and fundraising. I will work with the students this summer as we help tell the story of Tuscaloosa's recovery from the Red Cross perspective. 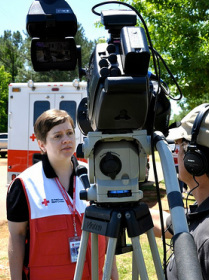 You can follow our efforts on Facebook at www.facebook.com/BamaRedCross and on Twitter @BamaRedCross. 1. Sent press releases not only to local media but to a long list of individuals and organizations in our area. I sent these releases daily for a time and reduced the frequency about two weeks after the storm. 2. Updated United Way’s website news page with the same information sent on above mentioned press releases. 3. Interviewed by several television outlets including WVUA, CBS 42, Fox 6, NBC 13, and The Weather Channel. 4. Interviewed for radio by B101.7 and WUAL. 5. Wrote a letter to the editor of The Tuscaloosa News thanking individuals and organizations for their support. 6. Sent thank you letters to those who donated to United Way of West Alabama’s Disaster Relief Fund. 7. Implemented a text to give option for our United Way which is currently being used for UWWA’s Disaster Relief Fund. 8. Spoke to a large group with UA’s Division of Student Affairs about what United Way did to help after the storm. DCH Regional Medical Center stood up its command center at about 6:45 a.m. April 27 when a tornado or straight-line winds destroyed several homes in Coaling. DCH Regional Medical Center received several injuries from this storm, and the Communication Department handled several media calls throughout the morning and afternoon. The command center was shut down about 9 a.m., but the communication equipment was left out because severe weather was expected later in the day. At around 2 p.m. Tuscaloosa EMA advised us that Tuscaloosa would shortly be placed under a Tornado Emergency. Bernie Grappe and I took our position in the command center, located in the center of the Regional Medical Center on the ground floor. As it became clear that a tornado was headed toward downtown Tuscaloosa, Nursing decided to protect patients in place by moving them away from the windows. Janet Teer, who was directing the command center, also sent Security out to ask visitors to move away from windows. Several hundred visitors were sheltered in meeting rooms and the cafeteria away from windows. Between 4:40 p.m. and 5 p.m., as we were monitoring the weather, it became clear that not only was a tornado headed for downtown, it also was headed straight for 809 University Boulevard East – the Regional Medical Center. At that time we made the decision to move patients, if possible, into hallways. There were several nursing personnel in the room, as well as others, and they dispersed throughout the facility to communicate that. Then the tornado came. I didn’t see or hear it. What I heard was a collective gasp from the visitors who were sheltered in the cafeteria, just across the hall from the command center. It was the sound that spectators make at a football game when their receiver barely misses catching a long pass, a long “whoa.” I ran across the hall to see what happened and found that doors that open off the cafeteria on to a small patio had blown open. Paper and napkins and debris were swirling around the room as about 100 people huddled beneath the cafeteria tables. I didn’t hear wind or a roar, only the bang and clatter of the doors. By the time the doors were secured, all I could hear was whimpering and crying from some of the people in the room with the exception of an old gentleman who wore a ball cap that read MSTR SGT. He continued to eat his chicken fingers. I don’t know if he was senile or had just been through so much combat that some wind didn’t bother him. By this time the power was off, and the building was lit with emergency lights powered by the generators. It added to the tension and cast spooky shadows around the place. Shortly thereafter, hundreds of injured and homeless people arrived. We had so many injured that the Emergency Department was dedicated to life and limb threatening injuries. Walking wounded was seen in makeshift treatment areas in meeting rooms, the cafeteria, an auditorium, cardiology, outpatient surgery and endoscopy. There were so many displaced people and discharged patients that we ran out of places for them. By about 3 a.m. the city had stood up two shelters, and the Tuscaloosa County Schools provided school buses to transport the uninjured and discharged patients to the shelters. Cell phones were spotty, but I dealt with media throughout the night on landlines, and about a half dozen reporters from NPR, AP, The Tuscaloosa News and others dropped in. I tweeted throughout the night, and the tweets were retweeted by local media, especially Clear Channel. Nikki Chandler updated the DCH website from her home in Pickens County for several days because she had electrical and Internet connections. The media onslaught continued for the next three weeks. The next day the rest of the Communication Department was on board to help handle the calls. Our office was without power, so we had to work out of a meeting room. This complicated communication, as did the fact that cell phone coverage remained spotty for about a week. You discover how dependent you are on 21st century communication when you are knocked back to the 1970s. In the weeks after the storm, we dealt with media literally from around the world. We worked with news crews or reporters from FOX, CNN, CBS, NBC, ABC and about a dozen local, state and regional affiliates, plus the LA Times, New York Times, Wall Street Journal, BBC, Al Jazeera America and a French news agency based in Miami. The coverage continues with requests for information and interviews from hospital trade journals. It was an exciting few weeks, but the volume of calls, the duration of the event and the technical issues created by power and telephone outages were a real challenge. While most of the media representatives were professional, some were rude and pushy. Some reporters and producers expected us to find and deliver patients to them who "wanted to tell their story." Our small staff didn’t have time to talk to 100 patients and vet their stories, and because of HIPAA (and just plain good manors), we determined it wasn’t our place to act as segment producers. One guy was upset because I wouldn’t let him “go to the ward where you keep the tornado victims” and let him wander around looking for somebody to tell him a sob story. Several reporters expected me to call patients who had been discharged and help set up interviews, which is a clear HIPAA violation. During this time we also wrote and produced a print and television ad thanking our employees and physicians for their response to the storm. I am very proud of the hospital’s response to this disaster, and even prouder of our small Communication Department.